Though not as famous as Safety Last (1923) or The Freshman (1925), The Kid Brother (1927) remains one of Harold Lloyd's finest silent comedies. It was Lloyd's personal favorite, and it's easy to see why. It crystalizes the three components that exemplified Lloyd's best features: a strong, character-driven story; expertly executed sight gags and humor derived through realistic, believable circumstances; and singularly polished production values. Criterion's new Blu-ray ranks among the best ever done for a silent feature. The transfer itself is impeccable. The image is incredibly sharp and steady, and presented at the proper frame rate - there are movies from the 1950s on Blu-ray that don't look as good as this does. Further, the wealth of extra features is fascinating and creative. This is a top-notch disc. Unusual for Lloyd, The Kid Brother has a rural, vaguely period setting. (Locals ride horse and buggies but modern automobiles are visible in the distance in a few shots.) Also unusual for Lloyd, while he falls head-over-heels with a virginal beauty as in his other films, that's really secondary to a larger conflict, of Harold's desperate to find a place in his own, all-male family. Sheriff Jim Hickory (Walter James) treats Harold alternately like a child and "womenfolk," leaving him to wash the dishes and hang the laundry while Harold's other, strapping brothers, Leo (Leo Willis) and Olin (Olin Francis), help their father cut down trees and enforce the law. Community leader Jim is about to realize his dream project, the building of a local dam, local residents having put up the funds for its construction and entrusting the bag of cash to Big Jim. While he and his two older boys are away at a meeting about the dam, Harold is mistaken for the local sheriff by Mary Powers (Jobyna Ralston), dancer for a traveling medicine show operated by shady "Flash" Farrell (Eddie Boland) and grotesque strongman Sandoni (Constantine Romanoff). Lloyd, immediately smitten by Mary, signs a permit allowing them to conduct business in the hamlet, this despite his father's clear disdain for such shows. Indeed, Sheriff Jim orders Harold to close it down in the middle of its evening performance, but an accidental fire burns down the enterprise before Harold can make any progress. He invites the now homeless Mary to spend the night at the Hickory home, while Flash and Sandoni conspire to steal the funds allocated for the building of the dam. Lloyd's "glasses" characters were grounded in a reality that set him apart from other silent era clowns. His was an emblematic 1920s go-getter, whose shyness, slight frame and gentle demeanor were things he'd overcome in a determined, almost feverish drive to achieve success. All these things are present, more or less, in The Kid Brother, but it's notably different in that Harold's longing this time is for acceptance within his own family. In most of Lloyd's films there's a cocky rival for the girl's affection, and in The Kid Brother it's neighborhood bully Hank Hooper (Ralph Yearsley), but he plays a minor, nearly extraneous part in the story. Jim and his sons, all twice Harold's size, are, significantly, not in any way villains. They're not male equivalents of the wicked stepmother and her daughters from Cinderella but mostly merely intimidating in their gruff manliness. They're not cruel to Harold, but rather just don't think he's up to "man's work." The script wisely includes an early scene where Jim and the two sons affix their signatures to a legal agreement concerning the dam, and they're amused when Harold asks to be allowed to sign the document, too. When at the end Harold finally proves his mettle - Was there any doubt about that? - and Harold's father declares to one and all that his youngest boy has proved himself "a Hickory," Harold is overcome with emotion, a lump in his throat coinciding with lumps in the throats of the audience watching The Kid Brother. Lloyd was heavily influenced by the practices of his old friend and former business partner, producer Hal Roach, who emphasized strong characterizations in his comedies and who took time and spent money to perfect his films before putting them into general release. Lloyd likewise spared no expense, and all his comedies from the early 1920s forward, including his talkies, are all polished, A-level productions. The Kid Brother lacks expensive-looking set pieces, like the big chase finale of Speedy (1928) for instance, but the lighting, sets, and camerawork are all first-rate. The Kid Brother's achievements are all the more remarkable given its troubled production history. Lewis Milestone (later the director of All Quiet on the Western Front) was the film's first primary director, but he and Lloyd, who had full creative control over the entire production, clashed and Milestone departed, with Ted Wilde and J.A. Howe taking over. At least eight writers/gagman worked on the script - Lloyd wanted more funny bits than any previous film of his - but many of these gags were ultimately cut. He seemed to recognize the film's big strength lie in his characters and familial conflict rather than funny sight gags, and the film is all the stronger because of the cuts. The gags that remain work in large measure because they don't exist for their own sake, but rather flow naturally from each situation. 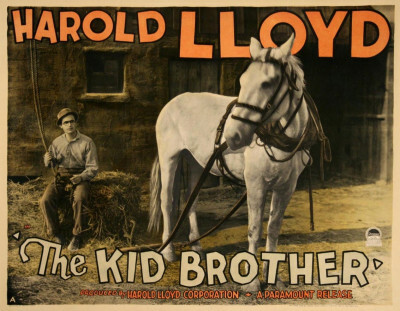 Criterion's release of The Kid Brother, in 1.33:1 standard format, sources Lloyd's own fine-grain positive, struck from the original nitrate camera negative, and remastered in 4K. As noted above, the image is astoundingly clear and free of damage, to a degree almost unheard-of for a movie more than 90 years old. The show defaults to Carl Davis's fine 1989 orchestral score, but Criterion also provides an alternate one performed on a Wurlitzer organ by Gaylord Carter, Lloyd's preferred soundtrack provider during the 1960s when The Kid Brother was revived at festival screenings. The film is also presented at the correct speed, and is Region "A" encoded. Supplements run far and wide. From the 2005 DVD release, there's an audio commentary track featuring Lloyd archivist (and former child actor) Richard Correll, who was very close to Lloyd in his last years, historian Annette D'Agostino Lloyd (no relation to Harold), and Lloyd's granddaughter Suzanne Lloyd. The latter is also interviewed by author Cari Beauchamp for "Harold's Leading Ladies," an impressive, highly-informed conversation about Bebe Daniels, Mildred Davis (later Harold's wife), and Jobyna Ralston. Beauchamp's observations are quite astute, and unlike the children or grandchildren of many Hollywood stars, Suzanne Lloyd has strong memories of her grandfather and grandmother, and is unusually well-versed on silent comedy, making this a fascinating discussion. Also included is a behind-the-scenes stills gallery curated by Lloyd archivist Richard Simonton, Jr., and a previous-released featurette about Greenacres, Lloyd's palatial home. Lloyd's mansion and grounds are also prominently toured in a 1962 interview with Lloyd for Dutch television. In this extended piece Lloyd belies his nearly 70 years, and his gregarious nature also exhibits Lloyd's considerable skill at promoting his film holdings and legacy. There's a fold-out booklet essay by critic Carrie Rickey, and two rare short comedies starring Lloyd: Over the Fence (1917), his first "glasses" character comedy, and That's Him, derived from rare 9.5mm and 28mm home movie editions. Even better, these shorts have their own supplements, with USC archivist Dino Everett discussing these offbeat film formats and the challenges in projecting and transferring them, and composer Nathan Barr and organist Mark Herman talking about the Wurlitzer organ used to accompany them. One of Harold Lloyd's best features, a real crowd-pleaser that's never looked better, on a disc overflowing with great extra features, The Kid Brother is one of 2019's best new titles on Blu-ray and a DVD Talk Collector Series title.